DK Windows’ Composite Doors are constructed from an impact resistant Glass Reinforced Plastic (GRP) external skin. GRP is light but has a higher strength for weight ratio than mild steel, making the door extremely strong and durable. The doors feature an internal PVC skin which is bonded to a welded, steel reinforced uPVC subframe. At DK Windows & Doors, we know what is important to you, that’s why each DK Composite Door is specifically designed to suit your needs. In order to understand the depth of our front doors range we suggest paying a visit to our Showroom, 5000 Sq Ft of top quality window & door products on display, in Dublin 12. Take a peek now through this 360° view of our Showroom. Check our other doors! We offer a range of uPVC doors, aluclad doors and aluminium doors. Our composite doors are strong and durable, ensuring your home and family are kept safe and secure. Apeer Traditional Doors come with traditional features and glass elements. 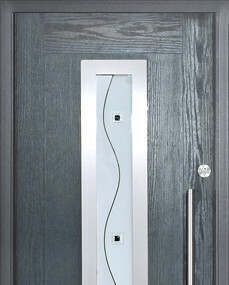 Our Apeer Contemporary Doors offer a wide range of glass designs. The Apeer Modo range offers modern doors with stainless steel glazing trims. Our composite doors are made of 70mm of high density polyurethane foam which doesn’t bent at all and it’s impressively very solid. Our composite doors are made of 70mm high density polyurethane foam, extra insulating double rebate, GRP inner frame, handmade triple glazed decorative units, double steel hinge bolts, kitemark version available and lifelike grain. Composite doors do not expand as the polyurethane foam is solid and it is compressed from each side by fiberglass. Can you cut composite doors? Cannot cut through a composite door as they are made of very hard material such as polyurethane foam inside and fiberglass each side. Can you stain composite doors? 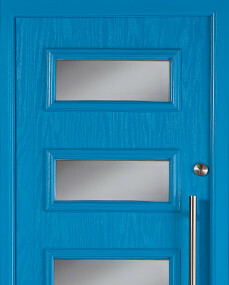 There are only timber effect colours available for the composite doors. There is no option for stain finishes. Are all composite doors the same? 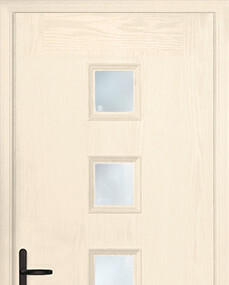 The composite doors are available in two options, one is 70mm model and the other one is the 44mm model.